Apple has released iOS 10 beta 3 download for developers. We heard reports that it may come early next month. However, there is an iOS 10 beta 3 download available for everyone. If you are running an iOS 10 beta on iPhone or iPad device, it is recommended to update your device. 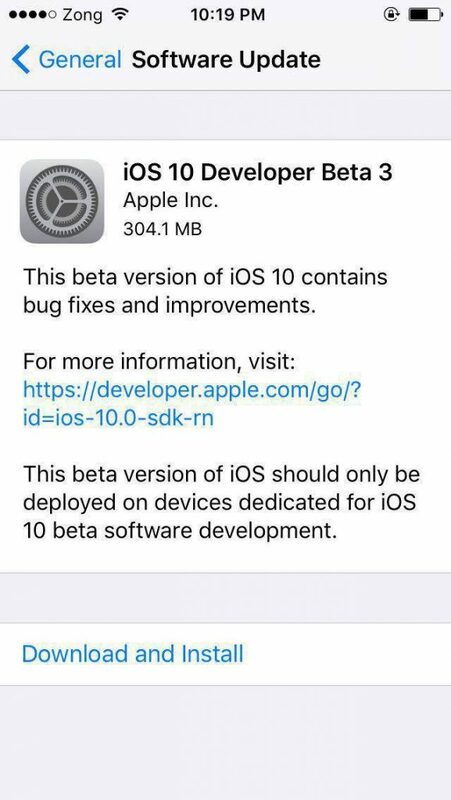 The iOS 10 beta 3 download can be accessed through Apple’s iOS Developer Portal and as well as can be downloaded through OTA update given to iOS developers. If you have iOS 10 beta provisioning profile installed on your device, there are chances you will get the update on your device. In iOS 10 beta 3 download update, Apple made some comebacks of features that were introduced in iOS 10 beta 1 but were removed in beta 2 from iOS 10. Most of the stuff is back on track, and there are fewer crash reports on iOS 10 beta 3. If you are planning to install iOS 10 beta on iPhone or iPad device, this is the time when you should get ahead with iOS 10 beta testing. Apple has fixed most of the bugs and started making iOS 10 beta more stable than ever. We remember our first encounter with iOS 10 beta 1 and all those quick crashes of popular applications. Earlier reports suggested that Apple has plans to alter the iOS beta release cycle with an attempt to decrease iOS 10 beta development builds for developers. Since the iOS 10 beta 3 release, we have seen a huge tick from the audience that their devices are back and they can use them freely as they were using on iOS 9. It was suggested that Apple might release the update in August and finalize beta development with two or more beta builds to iOS 10. Now, iOS 10 beta 3 is released to developers, the iOS 10 Public Beta 2 is expected to come on Thursday for beta testers. If you have installed iOS 10 public beta then, you should wait for the public beta 2 update for your devices before installing this beta. Apple is rapidly working with developers to make sure iOS 10 becomes the next sensation for iPhone and iPad devices. We are tracking iOS 10 beta development changes to report our audience about the major changes happening in iOS 10. We are compiling our features changes report soon. You can download iOS 10 beta 3 for your device using the mentioned Mobile Provisioning profile on your device. In case, if you don’t know how to install iOS 10 beta, here is how to install it. Step 1: Backup your device using iCloud & iTunes. Step 3: Install & Restart your iPhone / iPad. Step 4: Go to Settings -> General -> Software Update. Step 5: That’s it. You will get an iOS 10 beta 3 download on iOS devices. You can get the iOS 10 beta 3 download using the above-mentioned steps on iPhone and iPad devices. There is no need to download iOS 10 beta IPSW files. The old process used to waste time. You can update your devices without connecting with iTunes. Apple has made the process easier. Now developers and beta testers can easily update their devices. That’s the best way to get iOS 10 beta 3 download.